What Are the Benefits of Ankle Weights & Glove Weights Used in Swimming? Aquatic weights boost your water workout by amping up resistance. Much like graduating from the shallow end to the deep end, aquatic weights enable you to advance to the next level of your fitness routine. The buoyant weights, which are designed to increase resistance during water-based workouts, offer added cardiovascular and fat-burning benefits. When your swim or gym routine is proving less than challenging, using weights is an excellent way to plow through fitness plateaus. Additionally, water workouts offer a comfortable, low-impact environment -- a feeling of virtual weightlessness -- for those looking to cross-train or rehab from an injury. Aquatic weights placed around the ankles produce a more strenuous workout, whether swimming, doing aerobics or water-running in the shallow or deep end. As your legs work harder to propel in the water, you’ll enhance muscle tone and strength for svelte gams. Vancouver-based personal trainer Bruno Jukic notes that the water environment is the safest place to utilize ankle weights, since the risk of harmful joint stress is greatly lessened. The materials used in commercial aquatic ankle weights are designed to prevent chafing, and they glide naturally through the water like a fitness-boosting extension of your own body. Some weights fasten solely around the ankle, while others appear as buoyant booties. Both achieve a similar effect -- to increase resistance -- though the shoe-like style can also prevent a painful impact with the sides or bottom of the pool. They also aid in gaining traction, which is particularly helpful if your feet come into contact with the floor of the pool, according to professional bodybuilder Shari Duncan. Another upside? Aquatic weights that fasten around the ankles can also be used on dry land to add resistance while running or walking. To build upper-body strength in the pool, simply make like a duck and incorporate some webbing -- no quacking required. Gloves designed for use by swimmers offer webbing between fingers to create more surface tension, requiring greater effort by arm, chest and back muscles. Many also feature holes to expose the fingers, so you gain resistance without sacrificing the feel of the water. Keep in mind that overusing aquatic gloves can put you at risk for shoulder injuries, according to Mary Donahue, physical educator at DeAnza College. 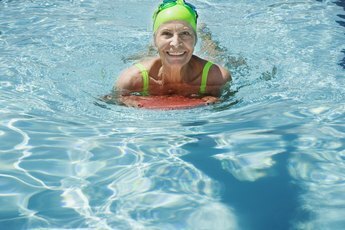 When exercising in the deep end, wearing a floatation belt or vest frees you up to focus on exercise form, rather than worrying about simply staying afloat, according to U.S. Masters Swimming. The goal of deep-water running or aerobics is not to tread water, but to build strength through cardio or targeted movements. Ankle and glove weights offer the same benefits in deep water as they do in shallower sections, and deeper water also translates to increased weightlessness. In general, aquatic weights are ideal for the already fit. Those who are just beginning to explore exercise in the water or who are overweight should consult a fitness expert or physician who can assess any possible risk of injury, according to Jukic. Start first by using your body’s own resistance to build up strength and stamina in the pool before adding additional resistance through ankle or glove weights.